When a smartphone runs out of battery power the first thing that you will want to do is grab its charger and charge the device. The #Samsung #Galaxy #S5 for example which uses a 2800mAh battery can be fully charged in just a few hours from a totally drained state. Once fully charged the phone is able to provide an impressive 27 hours of 3G talk time. There are however instances when charging related issues can occur on this device. This is what we will tackle today as we deal with the Galaxy S5 will not charge issue & other related problems. If you own a Samsung Galaxy S5 or any other Android device for that matter then feel free to contact us using this form. We will be more than happy to assist you with any concern that you may have with your device. This is a free service we are offering with no strings attached. We however ask that when you do contact us try to be as detailed as possible so that an accurate assessment can be made and the correct solution can be given. Problem: The phone will not charge and the battery sign shows up with a caution symbol over it. I believe the charger I used may have been damp and caused an issue but I am not sure where to go from here. The phone was still working completely fine until it ran out of battery. Solution: The caution symbol over the battery means that it is not communicating with your phone. There are various reasons why this can occur on a device which we will tackle below. Perform the troubleshooting steps listed below, move to the next step if the current step fails to resolve the issue. Take out the battery from the phone. Clean the battery contacts using an eraser. Do the same with the battery pins of the phone. Take care not to bend the pins. You should also clean the phone charging port using a can of compressed air or cotton bud dipped in alcohol. Reinsert the battery then check if the issue still occurs. Check the battery if it is water damaged. To do this just look at the sticker located on the metal contact side. This sticker should be white. If it is red, pink or purple then the battery is water damaged. If this is the case you need to replace the battery. Try using a different battery. If the problem still occurs even after performing the steps listed above then you should have your phone checked at a service center. Solution: The issue could be with the charging port of your phone. Turn off the phone and take out the battery. Clean the charging port of your phone using a can of compressed air or cotton bud dipped in alcohol. This will take out any dirt or debris which could be present in the port and could be causing the problem. Try to check if the phone will charge. If the issue still persist then the next step is to check if the phone software is causing this problem. Backup your phone data then do a factory reset. Once the reset is done check if you are able to charge the phone. If the above steps fail to resolve the problem the this could already be caused by a defective charging port or a faulty power IC. I suggest you have your phone checked at an authorized service center. Problem: The phone is dead with no signs of charging. I suspect this is because overnight I plugged it into a non-USB 3 receptacle (the thing with the actual electrical prongs you plug the USB into). I didn’t look to see if it was charging. In any case, I cannot charge it even now using different sources. This is the first real trouble I’ve had with this phone in two years. Solution: Try using a different battery on your phone. This way you eliminate the possibility that the battery is causing the problem. If the issue still remains even with the new battery then try to clean the charging port of the phone using a can of compressed air or cotton bud dipped in alcohol then connect the wall charger and charge the phone for at least 20 minutes before turning on the device. If the above steps fail to resolve the issue then have the phone checked at an authorized service center as this may already be a hardware related issue. Problem: my phone worked well… until this other day, when I took it out and saw the words “Downloading… do not turn off target” panicked by the heading i removed the battery since i wasn’t familiar with whatever that was happening… ever since that moment,.. no matter where/how i plugged in my phone, it just wouldn’t charge… any help in solving this issue would be much appreciated. Solution: When you see the “Downloading.. Do not turn off target” message in your device it is getting software updates. Since this got interrupted then issue such as this could happen. What you want to do right now is to take out the battery then press and hold the power button for at least a minute. This will discharge the phone circuit and clear out its RAM. Reinsert the battery then check if you are able to charge the phone. If you are still unable to charge the phone then follow the troubleshooting steps listed below. Move to the next step if the step you performed does not solve the issue. Clean the charging port of the phone using a can of compressed air or cotton bud dipped in alcohol. What you want to do is to take out any dirt or debris that may be present in the port which could be causing the issue. Try charging the phone using a different wall charger. If the problem still occurs after performing the steps above then you should have you phone checked at an authorized service center. Problem: Hi, I charged my Samsung S5 G900F overnight , the next when I wanted to power on it has no respond and won’t turn on . Have tried to remove battery and performed hard reset but it failed. 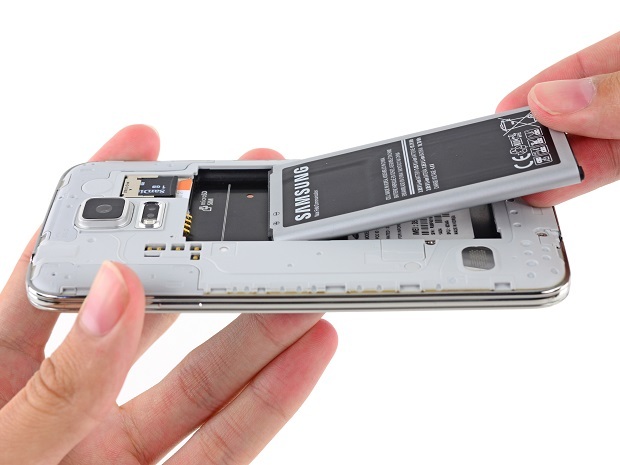 I noticed the phone is very warm when the battery is placed inside. Please help . Many Thanks. Solution: Try taking out the battery then press and hold the power button for at least a minute. This action discharges the phone circuit and clears out its RAM. Reinsert the battery then try to turn on the phone. If the phone does not turn on then try using a new battery. If the above steps fail to resolve the issue I suggest you have your phone checked at an authorized service center. Problem: Okay, so my galaxy s5 continues to reboot it’s starts up says Samsung galaxy s5 and the turns off and does it again, now the reason why I can’t find an answer on any forums is that it does not turn off or reboot if it is plugged in and charging. There are no charging issues, it charges perfectly. But if it was a hardware issue I think it would still do it when it was charging. If you could help me solve my issue I’d really appreciate it. Solution: There are two things that you need to do to resolve this issue. The first step that you should do is to get a new battery and see if this fixes the problem. Sometimes if the battery is not providing the correct power to the phone issues such as this can occur which is what we want to check. If the problem still remains even with a new battery then you should backup your phone data then do a factory reset. If the above steps fail to resolve the problem then I suggest you have your phone checked at a service center.